How to recover files from virtual disk? There’s an increasing number of people who use virtual machine and disk in their life and work, but not every one of them knows how to recover lost files from virtual disk. This article gives one solution. Actually virtual disk recovery is as easy as common disk data recovery as long as you use the appropriate data recovery software. 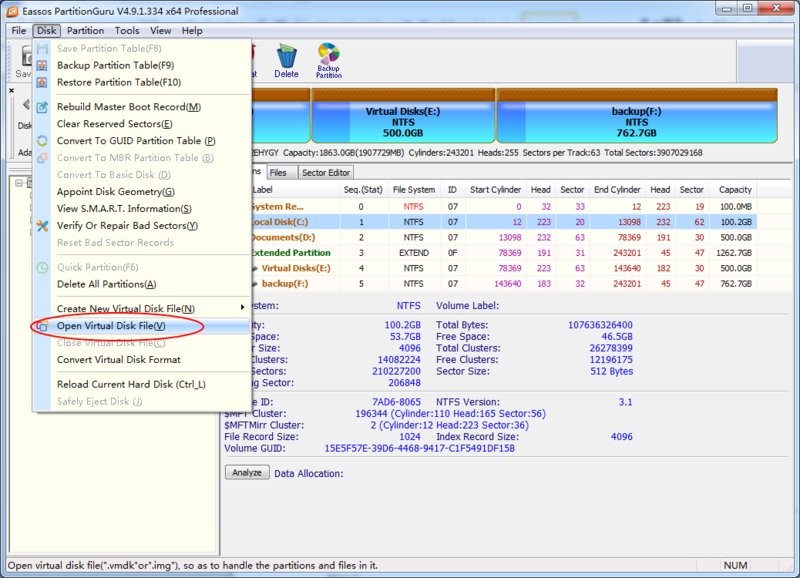 Here I’d like to use Eassos Recovery to explain how to recover lost files from virtual disk. Eassos PartitionGuru supports recovering virtual files of VMware (“.VMDK”), Virtual PC (“.VHD”) and VirtualBox (“.VDI”) and it can recover lost files and partition from virtual disk without running virtual machine, whose operations are almost the same as recovering data from a real disk. How to do file recovery & partition recovery from virtual disk? Step 1: Load the virtual disk that needs recovering data. Step 2: Select partition that loses data on virtual disk and click “File Recovery” button. Step 3: Select files and recovery. After file scanning is done, you can copy files to a secure place. This entry was posted in Data Recovery and tagged data recovery software, virtual disk recovery by EASSOS. Bookmark the permalink.